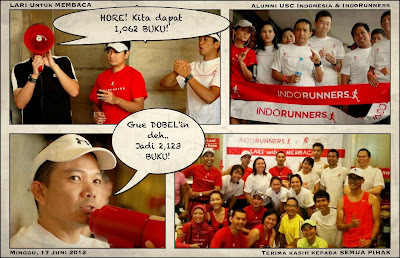 In November 2011, a friend of mine signed up for her first full-marathon, to raise funds for AUSCI's library-building program (providing reading sanctuaries for primary-school children in Indonesia's suburbs). This combination of a healthy physical activity (running), and doing it for others (besides for your own health), piqued my curiosity. As it turned out, after a 20+ year absence, an international marathon was in the process of being organized in Indonesia. In late December 2011, I heard about the "BII Maybank Bali Marathon" having been confirmed for Sunday, April 22nd, 2012. Though it seemed like a crazy idea at the time (i.e. having never ran more than 10K all my life), I decided to sign up for my first full marathon, aiming to also help raise funds for the aforementioned library-building effort. When all was said and done, this particular "R3 - Running for Reading Rooms" marathon effort raised enough funds to build 13 (thirteen) CerdasBang! libraries for the state primary-schools in Sleman, Central Java. Primary School Children in Sleman, Central Java, appreciating their NEW Library. Getting the finisher medal for my first marathon, in the first ever international marathon in BALI, was indeed special. But even more exhilarating was the experience of going over to Sleman (Central Java) on May 31st 2012, and officially opening three of the thirteen libraries built from the "Running for Reading Rooms" effort. I continued running regularly after the marathon in Bali, and I became more actively involved with IndoRunners, the largest running community in Indonesia. 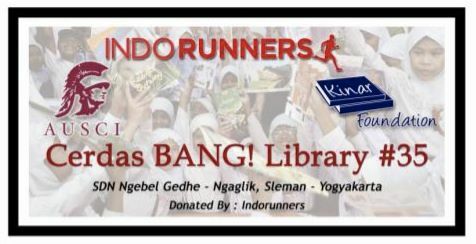 On Sunday, June 17th 2012, AUSCI hosted a joint event with IndoRunners = 'Lari Untuk Membaca" (Running for Reading), whereby for each 1,8 kilometer (1,1 mile) loop that a runner completes, he/she will "generate" one book for children. In a span of 2 hours, the event generated a cumulative 1,158 kilometers (720 miles) from 160 runners. Indra and Sandi Uno, the founder of "Berlari Untuk Berbagi" organization, kindly doubled the funds raised that day, and we ultimately had enough funds to renovate another library (instead of just donating books) for an additional primary school, SDN Ngebel Gedhe, in Sleman, Central Java. These two efforts raised awareness about the positive impact that running can have, when corporations/donors "convert" kilometers generated by everyday runners, into actual funds for charitable causes. Such programs seem quite commonplace in the United States and elsewhere, but it is a new and exciting proposition for Indonesia's running community (and corporate sponsors). To move this effort forward, I coined the term LUAS = Lari Untuk Amal Sosial, loosely translated as "RUN DMC = Run, Donate, Motivate, Charity," and I volunteered to handle LUAS under the auspices of IndoRunners. 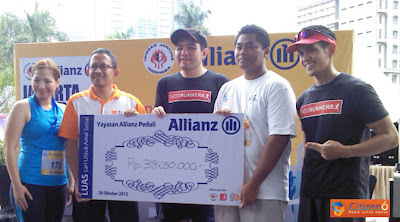 On Sunday, October 28th 2012, IndoRunners hosted a LUAS event with Allianz Indonesia, this time combining real kilometers plus virtual kilometers at endomondo. This particular LUAS effort generated enough kilometers to distribute 1,000 cans of corned beef to people in need, in conjunction with Idul Adha 1433 H.
Through LUAS, every able-bodied individual can maintain their health and do their part to help others (after they become healthy themselves), just by running regularly and uploading their accumulated "care" kilometers. Corporate sponsors should, in theory, be happy to get involved, because they will get two-birds-with-one-stone = their brand associated with a healthy activity for the general public, AND their sponsorship funds going to a charitable cause at the same time. In late January 2013, Jakarta was besieged with floods. A small LUMBA (Lari Untuk Musibah Banjir = Running for Flood Victims) virtual-event was immediately put into action by IndoRunners. In one Sunday (January 20th 2012), fifty plus runners, a few donors and Yayasan Kechara joined hands. This resulted in food + drinking water + medicine + daily needs being successfully, and immediately, distributed to families in need, in the flood-ravaged area of Petamburan, Jakarta. 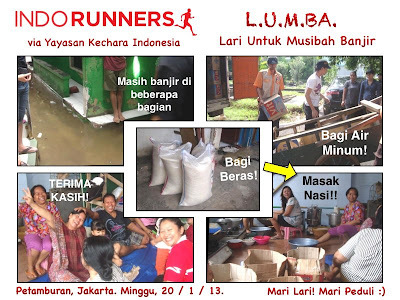 LUMBA - Running for Victims of Floods, January 20th 2013. Want to get involved? Wherever you may be in the world, you can join us by signing up with IndoRunners' virtual community at endomondo. Thanks Leona Fassi. What is "PIC Grant?"